The world has changed profoundly since the publication of the influential book Technopoles of the World. As policy-makers and practitioners attempt to harness science, technology and innovation to create dynamic and vibrant cities many wonder how relevant Manuel Castells and Peter Hall's messages are today. Twenty years later, this book returns to their concepts and practices to update their message for the 21st century. 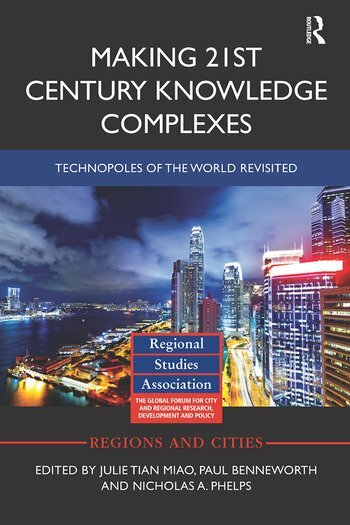 Making 21st Century Knowledge Complexes: Technopoles of the World Revisited argues that the contemporary technopole concept encompasses three new dimensions. Firstly, building synergy between partners is vital for the success of complexes. Secondly, the correct governance arrangements are critical to balance competing interests inevitable in any science city project. Thirdly, new evaluation mechanisms are indispensable in allowing policy-makers to steer their long-term benefits. Through twelve case study chapters and a detailed comparative analysis, this book provides academics, policy-makers and practitioners with critical insights in understanding, managing and promoting today's high-technology urban complexes. Julie Tian Miao is Lecturer in Urban Planning and Development, University of Glasgow, UK. Paul Benneworth is a Senior Researcher at the Center for Higher Education Policy Studies (CHEPS) at the University of Twente, the Netherlands. Nicholas A. Phelps is Professor of Urban and Regional Development, The Bartlett School of Planning, University College London, UK.